0n August 26, 1951, JW Roberts Jr was born to the loving union of JW and Sarah Jane Roberts in Silsbee, Texas. JW was the seventh child of eleven children. We called him Joe or Junior. Joe was called home to rest in God's Heavenly Paradise on January 4, 2019. Joseph was baptized as a child at St. Paul M.B.C. Joe received his education in Sacramento. 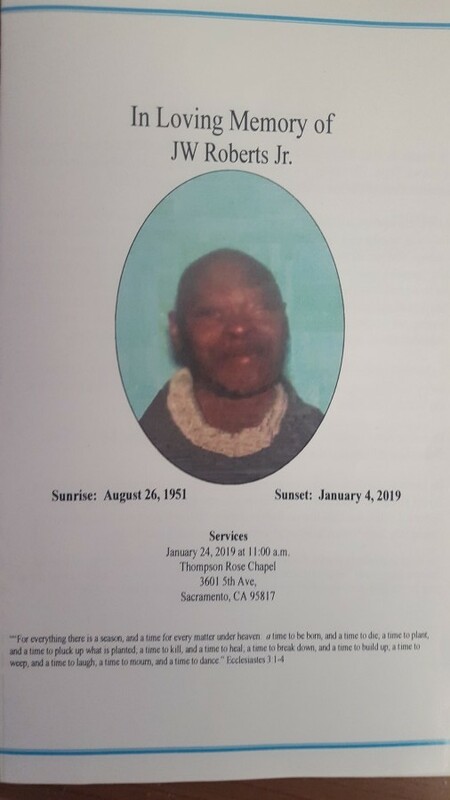 Following his education, he worked as a Painter; he worked for the city of Sacramento as a Garbage Man and Meals on Wheels serving the elderly; most of the clients became very fond of him. Joe was a man of many talents, very creative, working on automobiles he got his passion for fixing cars from his father; and he enjoyed working with electronics. He had a great love for music of all genres with David Ruffin being his favorite artist. His various hobbies were fishing, hunting, and gardening. He also enjoyed cooking and painting houses. He was a sports enthusiast as well as an athlete playing baseball, boxing, and practicing martial arts. Junior was a man of few words; he had a very strong belief in the Lord. He was a fair and loving man and had great character. when he gave his heart, you had something greater than any worldly possession. He was preceded in death by his parents, JW and Sarah Roberts, siblings Eva Lois Watts, Sharon Louise Roberts, Gloria Jean Brown, Frances Jean Roberts. He leaves to cherish his loving memories and legacy to his children Amanda; Horatio, Clea, Jaynie, Joseph Jr. Aikeem and Sequita; seven adorable grandchildren; his siblings Edna Roberts, Linda Grier, Elise Brown, Rodney Roberts, Melvin Roberts and Sandra Roberts; a special lady Janie Broderick, a host of nieces, nephews, family and friends.